Why Do My Betta Fish Fight? Ah, the Betta fish! Known to be one of the most majestic aquatic pets, these little creatures are quite a sight to see! If you’ve owned one of these beautiful fish or know about them, then it’s expected that having one or more of these creatures together will cause them to fight — but why is that? When you decide to have a Betta fish in your home as a pet, you may want to have more than one. To have multiple fish friends is fine — but it depends on their “housing” situation. Before you purchase a Betta fish, it’s important to know that having two or more male Bettas in a tank will turn into a boxing match. Although this could happen with female Betta fish, the male Betta fish are prone to become very territorial, wanting to dominate anything that crosses their path. When your Betta fish are ready to fight, you’ll notice that they may grow a little larger than usual and their silky fins will become enlarged, too — but what exactly are they fighting over? Believe it or not, Betta fish are known to fight over many necessities, but the largest commodity is food. Despite feeding your fish the correct amount of food each day, male Betta fish try to fight each other to receive more meals — and show the other Betta fish who rules the “kingdom” (tank). The fish become quite aggressive and will stop at nothing to collect a surplus. Another common reason Betta fish fight is to claim their territory. 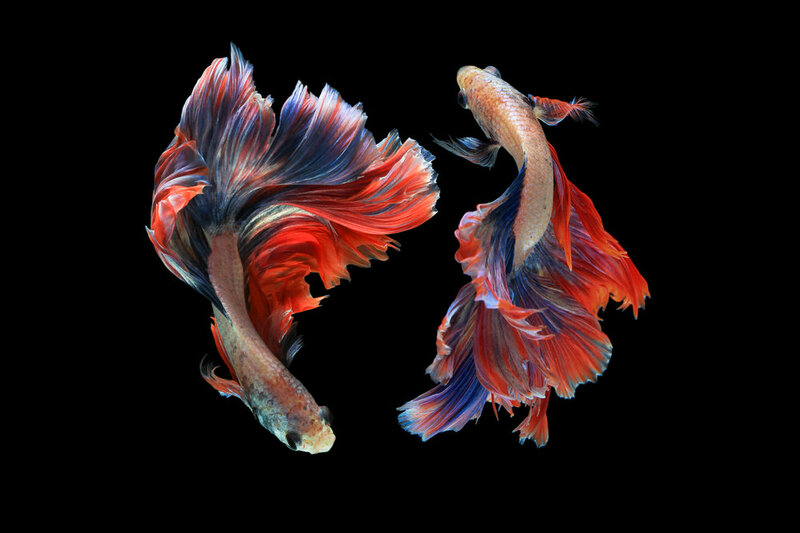 As mentioned earlier, when you place two or more male Betta fish within a tank, they will begin to fight on a daily basis. Since their tank is such a vital aspect in their lives, male Betta fish will go out of their way to make it known that they are the king of the castle — not matter how big or small they are. If you’re looking to have more than one Betta fish, then there are a few ways to stop the boxing matches in your home. If you’re the owner of more than one male Betta fish, then there are a few ways to maintain the peace between the fish in your home. The first solution is to keep each of the fish in a separate tank. When keeping your Bettas in separate tanks, this will keep them apart from each other, making it completely impossible for them to fight. The second solution to prevent your Betta from fighting, is to create a barrier between the two fish within a large tank. The barrier can be made from a rust-proof wire mesh and placed within the middle of the tank. This will maintain the peace between your fish friends — and won’t cause them to fight, even if they see each other. Looking to add a few new fish to your tank? Have any questions about what types of fish are compatible? Visit our Mineola pet store — we are here to help you find the perfect fish for your home’s tropical aquarium.